The hardest part about cruising is leaving the ship… not because it’s difficult, but because it’s hard to leave the fun. But since that final disembarkation is inevitable, knowing what to expect should make it a bit easier. The final night on board, you’ll get a detailed list of all charges made on the ship during your vacation. If you didn’t keep up with that during the cruise, check that everything is accurate. Mistakes are rare, but they do happen. Remember that gratuities for cabin stewards and wait staff will be added to your account as well. If there’s a problem with your account, go to Guest Services as soon as possible. There’s always a long line to dispute charges (rarely a cruise line error, but it is possible) or to make final settlement if using a debit card. Be patient. 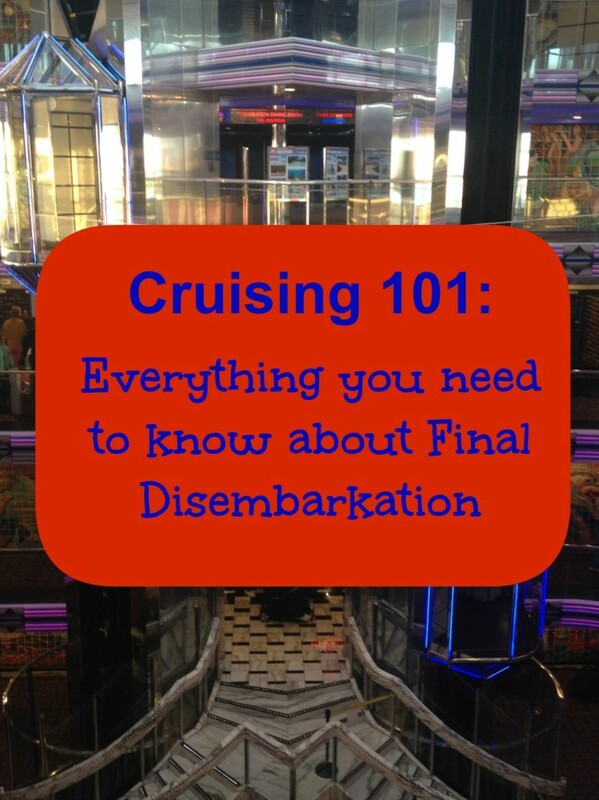 Cruisers who park at the port for their cruise vacation have two options for final disembarkation. Set bags outside your door the night before disembarkation. This option, used by most cruise travelers, involves packing most of your stuff the night before you leave the cruise. It requires a bit of forethought — especially if you don’t want to be “that guy” who has to juggle bathroom bag, souvenirs, and PJs at final disembarkation because he didn’t save a bag. Of course, the advantage of this option is less to manage that last morning. Which is best for you depends on how much you have to carry, whether you have kids or others in your party who need assistance and how quickly you want off the ship. No matter which option you choose, a strategic approach to your last day full day on the cruise will make going home easier. The last full day of the cruise involves packing to go home. Yes, the cruise must come to an end. Your last dinner at sea will be casual. Wear the same pants or skirt to dinner that you plan to wear for the trip home the next day. That way, you can pack more clothes for the cruise staff. Have a bag available for wet clothes. Swimming the last day of the cruise means wet clothes will go home. We pack a kitchen garbage bag in our luggage so wet clothes don’t get everything else wet. Pack as much as you can, especially if you’ll be letting the cruise staff move your bags for you. The less you have to carry, the easier it will go. Set luggage outside your cabin door before you go to bed. I know — that seems weird to first time cruisers, but it is an effective method. Of course, be smart. Don’t pack electronics, IDs, money or credit cards in that luggage. You’ll receive a customs declaration form. Be sure to complete one for your family and keep it in your carryon luggage for easy access. You’ll also need your cruise ID card, photo identification and passport or other proof of citizenship. Keep those papers with you and someplace easy to access. Duty free alcohol purchases will be delivered to your cabin the last night of the cruise. Disembarkation day is really all about getting you off the ship so it can be cleaned for the next cruisers. Cruise lines have this down to a science! You’ll have a designated dining room and time for breakfast. You’ll be called to disembark when the queue from the group before gets smaller. For those flying home, a later flight time (noon or later — plus drive time if you’ve got far to go) is a good idea, just to be safe. As you leave the ship, you’ll check out with your cruise ID card one last time. Then, you’ll proceed to baggage claim to get your checked bags. Make sure you count all your bags before proceeding to customs. NOTE: If you had any items confiscated as you came aboard (irons for wrinkled clothing are never allowed on cruise ships), claim those at baggage claim as well. At customs, you’ll have to present proof of citizenship, your declaration form and photo ID if not using a passport. Pass through customs and head to the parking lot. That’s it — final disembarkation is done! The only problems I’ve seen with final disembarkation tend to involve people who are not prepared to go home. Remember that souvenir purchases have to fit somewhere to go home. If there’s not space in your luggage, look for a bag to carry items in. Don’t wait until the last second. The crew needs to clean your cabin for the next passengers, and if you pack the night before, you’ll not be rushed in the morning. Know which dining room you’re assigned to. Your last daily guide will list the dining room and your disembarkation time. That’s the ideal schedule — but if the ship gets behind, enjoy another cup of coffee! Keep your ID, proof of citizenship, cruise ID cards and declarations form someplace easy to reach. I can’t tell you how many people I’ve seen rummaging through checked bags to find these documents. UGH! Count your bags. I take a photo of all my checked bags outside my door to show cruise staff if anything gets lost (it’s never happened to me). Be patient. We all want to go home (or at least get the waiting over with)….. and it all works out in the end! Experienced cruisers, what’s the biggest mistake you’ve ever made preparing for final disembarkation? What’s your best tip for first time cruisers? We recently returned from our first family cruise. Our daughter, who is a terrific planner as a rule, packed all her shoes in her luggage that was hustled off to meet us after debarkation. Soo. Remember to leave out a pair of shoes as well as your clothing! The easiest disembark for us is to book a later flight (cheaper, btw) and go on a ship-sponsored excursion in the port city. You are first off and first through customs. You have a great relaxing day with lunch not in the airport. Around 1, you and your luggage are reunited at the airport, which is now almost empty — stress free. My family’s first cruise is coming up in a couple months, I’ve been trying to research as much as possible on what to expect and disembarkation seems to get lost behind all the other things to cover on cruises. I’m very glad you shared this. I feel more prepared and at ease about the process. So glad to hear that, Aja. How was the cruise?